As I cross a street in Washington, DC, a shiny black Mercedes stops to let me pass. “Made in Germany,” I think. I pass an electronics store with giant flatscreen TVs (Made in Japan) and a trendy clothing boutique with pretty shirts (Made in India). I get into my General Motors (Made in America) car and drive to a superstore. Pick up a toy – it is made in China. Those cups and plates, curtains for the home, the new pair of shoes – China, China, China. In the last four years, China has emerged as the definitive leader in global manufacturing. And yet, is the manufacturing share of global GDP large enough (at 16%) to have a positive effect on the other leading economies? University Magazine takes a look at the world’s top manufacturing countries and how the industry affects their economic outlook. Besides accounting for 16% of global GDP, manufacturing accounts for 70% of all global trade. Service jobs in manufacturing make up 30-55% of manufacturing-heavy economies, and every for every dollar of manufacturing output, only 19 cents are spent on service input – quite a profitable enterprise. However, while advanced economies like the United States are coming up with more innovative manufactured products, they are outsourcing much of the traditional labor-and-time-intensive manufacturing jobs to other economies, such as China or India. In fact, out of the 62 million manufacturing jobs available in advanced economies in 2000 only 45 million remained in 2010. And many of these jobs were in different industries, requiring more specialized knowledge and training. While this may be a source of outrage to labor unions and anti-globalization groups, overall, the advanced economies prospered. According to the McKinsey Global Institute 2012 report, Manufacturing the future: the next era of global growth and innovation, advanced economies had a $342 billion trade deficit in labor-intensive goods, yet also a $726 billion surplus in innovative goods. When we look at the last 25 years of manufacturing, we see several trends. 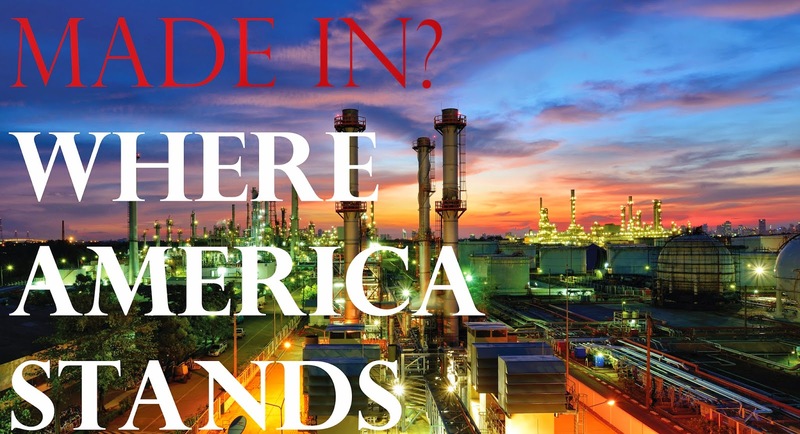 Overall, the number of jobs created by manufacturing in the world has significantly increased. However, a large portion of the newly-created jobs are in developing and industrializing economies. In developed economies, like the United States, Canada or the United Kingdom, the percentage of manufacturing jobs is declining and the industry areas and type of remaining manufacturing jobs are shifting to be more innovative and technologically specialized. Large, developing economies have been moving up in global manufacturing. Finally, many of the economies that have been increasingly significant in manufacturing are Asian. The prime example of this is China, which had first surpassed the United States in its share of global manufacturing in 2010. China is also the number one exporter of manufactured goods, and well as the second largest importer. A steady increase in the share of global manufacturing can also be seen in India, moving up from 15th spot in 1980 to ninth in 2012. 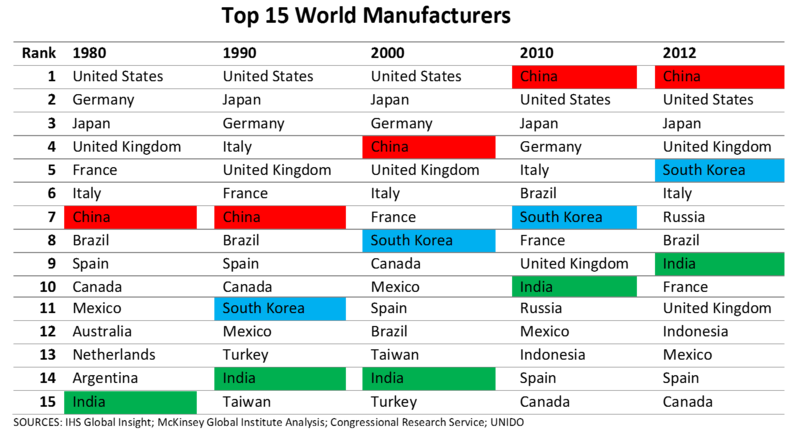 Finally, a much faster movement is seen in South Korea, 25th in 1980 and all the way up to fifth in 2012. The reasons for that are many – a shift in favorable economic policies in those countries, a cheap and available workforce and improving research and development. But does that mean an overall global shift to the East? While China has taken over many areas of production and will remain strong, the United States remains extremely competitive in terms of manufacturing. China may have the lion’s share of many global products, China’s exports are primarily in the toys, apparel and electrical and electronics industries. In fact, China is the world’s largest manufacturer of toy products, with over 70% of the global market. The country presents several advantages to manufacturers: a growing middle class, increased research and development, a robust raw material supply base and established infrastructure, it also presents several challenges. It is slow to innovate, with a heavy tax burden and regulatory inefficiency, which results in lax quality control. On the other hand, despite its high labor costs and corporate tax rate, the United States has a highly technologically advanced labor force, with much research support for national laboratories and universities, high productivity and favorable policy actions. It is the second largest automobile manufacturer and the largest producer of ethanol biofuel. With manufacturing continuing to play an important role in the world economy, there will be enough of a share within all the various manufacturing industries for all of these economies, both developed and developing, to grow.